MidiREX UI is a set of pages. Rotate encoder to select a page. Click encoder to enter page parameters editing mode. While in this mode, press SW1-4 to select parameter to change and use encoder to set parameter value. SEL+RUN toggles song mode. The LED above the SEL switch is fully lit on when MidiREX is in Song mode. REC switch toggles recording and executes action on some pages. When recording a track the LED above the track switch is blinking with the beat. When recording a song the LED above SEL switch is blinking with the beat. SEL+REC initializes currently selected track after confirmation. SW1-4 toggle track mute when on the Main and Note Part Selector pages. On other pages SW1-4 select parameters. The selected parameter appears in square brackets. SEL+SW1-4 selects current track. The currently selected track LED is fully on. When recording, the incoming MIDI events are stored on the currently selected track. Encoder click toggles parameter editing mode. SEL+Encoder click enters part or song name editing mode when on the Main page. Encoder rotation selects user interface page or changes parameter value when in parameter editing mode. If SEL is held down while rotating the encoder, the parameter value is changed in decade or octave increments. Double clicking on the encoder activates Main page. SW1-4 toggles track mute. The muted track LED is off. SEL+SW1-4 selects current track. Currently selected track LED is fully on. Clicking the encoder toggles parameter editing mode. While in this mode pressing SW1 selects part or song name. Encoder rotation while in parameter editing mode selects part if MidiREX is in part mode or song if song mode is in effect. SEL+Click the encoder while part or song name is selected for editing enters name editing mode. In this mode you’ll see a blinking cursor. Use SW1 and SW2 to move the cursor, SW3 to insert a character, SW4 to delete a character. Rotate the encoder to change the character at the current cursor position. Pressing SW4 selects part or song tempo. Repeatedly clicking SW4 with the beat will automatically set the desired tempo (‘tap in tempo’). SW1-4 selects a track to change the length for. Rotating encoder changes track length. Note that track length is a logical value which is independent from the events recorded on the track. Any track (including an empty one) can be set to any length without affecting the track’s events. For example, track with full 8 bars of events can be set to be just 4 bars long so that only first half will be played back, or, if you set its length to 16 bars, it will be silent half the time. Clicking the encoder toggles track length editing mode. SW1-4 changes track channel. If track channel is set to OMNI (‘–‘), the track events will be sent to MIDI OUT with the original channel they were received on. This setting is useful when merging several tracks into one if you want the resulting track to play event on the original MIDI channels and for MPE (MIDI Polyphonic Expression) controllers support. Clicking the encoder toggles track channel editing mode. SEL+Clicking the encoder saves current track channel configuration as default. Uninitialized parts will automatically assume default channel configuration. Pressing and releasing SEL switch with no other switches pressed restores default track channel configuration for the currently selected track. SW1-4 changes track transpose mode: if set to ‘on’, note events received on MIDI IN while playing will transpose this track notes relative to the part’s root note (see below). Disabling track transposition is useful for drum tracks. Clicking the encoder toggles track transposition settings editing mode. SW1-4 changes track recording mode: if set to ‘rx’, the corresponding track will record MIDI events on the device’s global MIDI channel (the one set on the “MIDI RX Channel” page). If set to ‘tr’, the corresponding track will record MIDI events on the MIDI Channel associated with the track (this is the one set on the “Track Channels” page). If the latter is set to OMNI (‘–‘), the track will record on all MIDI channels — this is useful for MPE (MIDI Polyphonic Expression) controllers. SW1-4 enters part root note editing mode. If currently selected track is not muted or empty, note events received on MIDI IN while playing will transpose part relative to the selected root note. If note event is received while part root note parameter is selected for editing the part root note is set to the received note (‘MIDI note learn’). Clicking the encoder toggles part root note editing mode. SW1-4 cycles through part switch mode options: immediate, on next beat, on next bar, on part end. Clicking the encoder toggles part switch mode editing. SW1-4 cycles through start recording options: on command, on track start, on track end. These affect recording start only during playback and have no effect if recording is started while MidiREX is not running. If recording starts at track start, all the existing events in track will be overwritten. If recording starts at track end, the new events will be appended to the end of the track, extending tack length. Clicking the encoder toggles start recording mode editing. SW1-4 cycles through stop recording options: on command, on track end, on part end. Clicking the encoder toggles stop recording mode editing. SW1-2 selects quantization grid parameter: note position will be moved towards the closest grid measure. SW3 selects quantization strength parameter: if set to 100% note positions will be moved exactly on the selected grid measure, if set to 50% they will be moved half way. Press SEL+REC to quantize notes on the currently selected track. When prompted, press SW3 to confirm quantization or any other switch to cancel operation. SW1-2 selects quantization grid parameter: note lengths will be adjusted towards closest grid measure. SW3 selects quantization strength parameter: if set to 100% note lengths will be adjusted exactly on the selected grid measure, if set to 50% they will be adjusted half way. Press SEL+REC to quantize all note lengths on the currently selected track. When prompted, press SW3 to confirm quantization or any other switch to cancel operation. SW1-4 selects MidiREX global MIDI channel. This is the channel MidiREX receives its commands on. This is also the channel the tracks record on unless track recording is set to record on the track channel, see ‘Track recording’ page. Clicking the encoder toggles receive MIDI channel editing mode. SW1 toggles program change events filtering. SW2 toggles control change events filtering. SW3 toggles after touch events filtering. SW4 toggles system exclusive events filtering. Clicking the encoder toggles MIDI receive filter editing mode. Lowercase parameter value means events are filtered: they will not be recorded or passed to MIDI OUT. Note that MIDI event filtering affects only events received on selected MIDI receive channel. SW1-4 toggles MIDI Clock source setting: internal or external. Clicking the encoder toggles MIDI clock source editing mode. SW1-4 changes MidiREX control change messages handling to: none, receive, send, both. For the list of recognized control messages see “Advanced features” section. Clicking the encoder toggles MIDI control change editing mode. SW1-4 cycles through click mode options: none, precount only, when recording, when running. Clicking the encoder toggles click mode editing. SW1-2 selects click note parameter. Rotate the encoder or play a note into MIDI IN to set the click note (‘MIDI note learn’). SW3 selects click note velocity parameter. Rotate the encoder or play a note into MIDI IN to set the click note velocity (‘MIDI note velocity learn’). SW4 selects click note channel. Press RUN switch to send click note to MIDI OUT. Press REC switch to send louder (strong beat) click note to MIDI OUT. Clicking the encoder toggles click note parameters editing mode. SW1-4 selects number of bars to play click sound before recording starts. If click bars count is set to ‘off’ recording will start immediately. Clicking the encoder toggles parameter editing mode. SW1-3 selects foot switch action: none, toggle run, toggle record, switch to next part, and switch to previous part. SW4 selects footswitch 1 or 2. Clicking the encoder toggles footswitch parameter editing mode. Both normally open and normally closed momentary switches are supported. The normal state is read when MidiREX is powered up. If your pedal action seems reversed, make sure it is connected and not stepped on when MidiREX is being powered up. This page merges one track into another combining all events in both tracks into resulting track, similar manner to track bouncing used in multitrack recording. Note that resulting track may contain events on different MIDI channels and if its track channel is set to OMNI (‘—‘) that track will play more than one MIDI channel. SW1 selects part with source or destination track. Rotate the encoder to select the part. SEL+SW1-4 select tracks to merge. Press SW3 to confirm merge action, or any other switch to cancel operation. If the source track is already selected steps 1 and 2 are not required. This page moves selected track, part or song to another location. Original item becomes empty. SW1 selects source part or song. Rotate the encoder to select the part or song. SW2-4 selects item to move: track, part or song. SEL+SW1-4 selects track to move (if moving track). Press SW3 to confirm move action, or any other switch to cancel operation. If the source item is already selected steps 2 and 3 are not required. This page copies selected track, part or song to a new location. Original item is not changed. SW2-4 selects item to copy: track, part or song. SEL+SW1-4 selects track to copy (if copying track). Press SW3 to confirm copy action, or any other switch to cancel operation. If the source item is already selected you may skip steps 2 and 3. This page sends selected track, part, song or all parts and songs to MIDI OUT as system exclusive message for backup purposes. The resulting sysex may be sent back to MIDI IN to restore the data it contains. SW2-4 selects what to send: track, part, song or all parts and songs. SEL+SW1-4 selects track to send (if sending track). Press REC switch to start sending sysex message. This page initializes selected track, part, song or all parts and songs on the device. SW1 selects part or song. Rotate the encoder to select the part or song. SW2-4 selects what to initialize: track, part, song or all parts and songs. SEL+SW1-4 selects track to initialize (if initializing track). Press REC switch to perform initialization. This page allows you to manually specify currently selected song steps. SW2 selects song step count. SW3 selects song step root note: the step’s part will transposed to this note when playing. If a note event is received on MIDI IN the step’s root note will be set to that note (‘MIDI note learn’). SW4 selects step repeat count: the step’s part will be played this many times. SEL switch selects step’s part, Rotate the encoder to change it. In normal mode SW1-4 toggle step’s part tracks mute. This page allows you to view currently selected track events. Click encoder to select the event. Clicking the encoder toggles event selection mode. Event editing is not implemented in the current version of the firmware. Future versions will allow track event editing. This page allows you to quickly switch parts by playing notes into MIDI IN. Here’s the idea: you select base note and part and when the base note or any note above it is received the base part (or consecutive part relative to the selected base part) is loaded. Notes below base note are handled as normal notes, only base note and the notes above it cause part switching. Note that part switching can be quantized to the next beat, bar or part end, see ‘Part switch mode’ page above. SW1 selects base part. Rotate the encoder to change it. SW2-4 selects base note. Rotate the encoder to change it, or play a note into MIDI IN to ‘learn’ the base note. If page is not in parameter change mode, pressing SW1-4 toggles track mute, just like on the Main Page. Press REC to start song recording. The LED above SEL switch will blink with the beat. Change parts by playing notes above the base note, play notes below the base note to transpose the part, mute part tracks by pressing SW1-4 – all these actions will be recorded in the currently selected song steps along with the number of times each step part has been played by MidiREX. This page allows you to quickly switch between up to 4 parts by pressing SW1-4. The base part will be loaded on SW1, the part next to the base part on SW2 and so on. Click the encoder to select the base part. Note that part switching can be quantized to the next beat, bar or part end, see ‘Part switch mode’ page above. When there is a pending part switch request LED above the new part switch is blinking. Press REC to start song recording. The LED above SEL switch will blink with the beat. Change parts by pressing SW1-4, play notes to transpose the current part – all these actions will be recorded in the currently selected song steps along with the number of times each step part has been played by MidiREX. See firmware source code for track and song data format details. Power on MidiREX while holding down the encoder. MIDI LEDs will blink shortly then MIDI IN LED will stay steadily lit. The display will remain blank or contain a line of box characters. Firmware update takes a couple of minutes, MidiREX will automatically reset when update is done. Check the version number display on MidiREX startup page. Most firmware updates do not require MidiREX memory to be reset. However, if you don’t find your parts and songs after firmware upgrade, please restore them by sending the sysex back up you created at step 1 to MidiREX MIDI IN. Power on MidiREX while holding down SW1, SW3 and SEL to reset it to initial state. Note that this will wipe out device memory without any confirmation. Use this to restore MidiREX operation as the last resort. Looking forward to using the event editor function! Question about midi receive: Would it be possible to add an option to record midi on all channels (not necessarily simultaneously)? I’m using MidiREX to send midi to a couple of synths and each time I want to record a new phrase for a different synth, I have to manually change the MIDI RX channel. You can just set MidiREX to the same channel as your MIDI controller connected to MidiREX’es MIDI IN and set individual track MIDI channels to the MIDI channels your synths receive on. Then selecting a current track will elt you play and record the target synths track. Thanks! I tried this before with no luck; What I had missed was that the MidiREX and the controller were not set to the same channel set. Works now..! I must say that this is a very handy and useful device. Great work, Peter! Hence, another feature request: A (global) setting for transposing to affect ONLY the currently selected track. Why? A) This way you could, for example, create quick melodic variations here and there by simply pressing the keys – and without affecting everything else. B) It would also help arrange / change the “scene” after it has been recorded: for example, 2 tracks 1 octave down and 1 track 17 semitones up, etc. C) Yet another reason is that transposing the recorded tracks with just playing on a master keyboard is so convenient and easy, it could be put into further use. I’ve had many nice accidents with it. I’m a bit confused: are you asking for on-the-fly transposition (i.e. temporarily transpose selected track only while playing) or destructive transposition that would permanently transpose track notes? I think I was mostly thinking about on-the-fly transposition (point A). Perhaps so that there is a “transpose per track” page somewhere for more deliberate controlling of transposing (point B). But now that you asked, it would be very nice if the current transposing settings for the tracks could be applied destructively as well. I believe (1) is already done. (2) may be implemented with Transpose page where you will have +- semitones settings for each track, pressing REC will apply selected transposition. (1) I’m talking about an option to transpose only the selected track, whereas now all 4 tracks (even on different midi channels) are transposed when hitting a key – which is good for other uses. Or am I missing something again? (1) well, this is a midi looper, not a versatile midi processor or full fledged sequencer. What you request may look interesting for you, but appears to be not exactly obvious for other users i asked. Okay, just a thought. Thanks, anyway. I think I need to build an Alf now! Another MidiRex comes alive! Built mine yesterday while watching football, good instructions. Working great! What’s IC2 spot for? I noticed there’s only one on the BOM and in the pic from the build instructions. I thought I was short a part but works fine without it. On to the MidiAlf after I build my first Shruti. The second SRAM IC socked is not currently used by the current firmware and should NOT be populated. It is reserved for future extensions. this looks very interesting, a pity the memory is so small and it’s only 4 track. it seems like an ideal follow up and sidekick to my trustee mmt-8. i have some questions i cannot figure out from the given informations: how does the unit behave in recording mode – is it possible to record a loop, then in the next cycle i record on the same track again and the unit is merging my recorded notes? that would be awesome. or – is it possible just to change the selected track and merge these together later? and furthermore, does it have functions to merge different midi channels to one track and maybe even extract a single channel to another track? it would also be cool to build several of these units and link them up via midi so that optionally they are synced in pattern changes, that way several units could be built for having more tracks, while they behave in a live pattern performance “like one”. ah yes, and how to switch parts without messing things up, is it possible via a midi keyboard or CC, so i can use the pads on a beatstep to switch between 16 different patterns? +1 / -1 by footswitch is very cumbersome if you have songs with many parts, also menu diving and encoder turns for pattern changes are not really a good thing to do in a live performance. When recording on the existing track, MIDI events are either replaced or appended, depending on where recording begins. If you need to record on top of the existing MIDI events, you need to record on different thread. Yes, you can merge several track into one track merging all the events. When merged, MIDI events preserve their channel. When played back, you can choose to override event’s MIDI channel with track’s MIDI channel, or play them back as is on the original MIDI channels. There is no function to split track by MIDI channel. You can hook more than one MidiREX to MIDI splitter (MidiThru works great for this) and feed them the same MIDI Clock, Start/Stop and Program Change commands — they will all play in sync thus extending number of available channels. Yes, it is possible to switch programs using MIDI Note events — check Note Part Set page. Hi there, I got a problem, Im trying to update the firmware, but if I power it on while holding down the encoder I don’t get anything differently on the screen then if i simply power it on. So how to proceed? Where did you get the MCU? Sorry, but what is MCU? Is it possible to clear a track with the sequencer running or does the init function work this way? Yes, you can erase track without stopping the sequencer. Is there some way to have the track lengths be remembered when you initialize the track or is there some other way to clear the data? Initialized track has its length reset to zero. What is the use case for clearing track events while keeping the track length setting? When I play live (techno), I usually want predefined track lengths. It’s better for them to be different but 1 synth, for example, might always be a 1 bar seq. initializing the track clears it and works fine, but there is an extra step to go in and change the length. I am having other issues with the one I bought though. It drops notes and seems erratic on the midi output. It also forgets everything when it’s turned off. Is there a save command or is it supposed to just store it automatically? There is no save command, recorded material and settings are saved automatically. When the unit is switched off, the memory is backed up by the on-board battery, so if you unit loses its memory you need to check the battery. Erratic MIDI output: please contact me using the email found in the ordering section and we’ll try to figure out what’s going on. Initializing track versus clearing track — thank you for explanation, i’ll check what can be done. Can someone explain what the different quantize options are? Cycling through gives me x, xt, xth, xd for each 2, 4, 8, 16, 32 etc. “th” I understand but what are the others? Great thanks. I have another question. Is there a way to have different timings other than 4/4 Like 3/4? Not at this moment, i have to add code to support this. Just a note that the command to quantize the selected track from the Quantize Note page appears to be SEL + REC, rather than SEL + RUN as listed above. Thanks! So, as I understand it (as a potential user), the notes may be left unquantized but the length of each loop must be quantized to full bars? Is this right? Is it possible to start record with a command and end record with a command and thus determine loop length? Quantization is optional for both note starts and lengths. Yes, you can start and stop recording with a command and this will set the record length. Thanks for speedy reply. So MidiRex can perform as 4 independent real time loopers, each like an audio looper, except the data is midi? What would the track length parameter do in this case? Could individual tracks be triggered independently via midi? Track are not independent, they play their own set of notes on their set channels. The total length of a loop is defined by the length of a longest track. Shorter tracks are repeated inside the loop, so, for example, if you have Track1 4 bars long, Track2 2 bars long and Track3 1 bar long, the loop will be 4 bars long and Track1 will play once, Track2 twice and Track3 4 times for each loop. You can also set loop length manually to be longer or shorter than longest track length. If track lengths are set via command, are those commands necessarily quantized. Meaning – can track lengths be unquantized? If so how is looping calculated? Is there a maximum track length? I had 3 tracks and the second was longer than the first and the third was longer than the second, then before adding a fourth track the looping would be based on the length of the third track… could I then add a very long 4th track, maybe empty, to control how the tracks repeat against each other? Track lengths are quantized down to a beat. Track length is limited by the memory, tracks with sparse events can be very long (64K 96PPQN ticks). Yes, you can add long 4th track to specify loop length. If it’s empty, you can just set loop length manually. The idea is — you played bass line, for example 8 bars, then, while having them playing, played pads on top, ending recording right after 4 bars… your sequence is now 8 bars long with pads repeating every 4 bars. After that you played a melody line on top of all which is 32 bars long, so now you lave 32 bar long loop. Now you copy this sequence into a next slot, and while having it played, silence the melody line, then replace the bass line with a fancier variant, then add a snappy sequence on track 4, then play another melody variant on track3, save it, go to slot 1 to play the original melody line… now you put this all into a song, so that sequence transitions are automated. Rotate encoder until you see Init page, then select track. Or just press Shift+Rec if you need to erase just recorded track. Midirex is looking very interesting. I have a question about recording overdubbing, though: What happens when I hit record on a track that already has some notes recorded to it, will they be erased or will the new notes added to them? I’d prefer the latter but if that isn’t the case, I should be able to “oberdub” with merging tracks, correct? Existing notes will be erased. Overdub by merging trick works. You’re exactly right. Alright. Thanks for the fast reply. I just finished building a fabulous MidiGal and a fabulous MidiRex, they work great. I just wanted to ask if there are any plans to expand the memory on the Rex. I’m trying to control the Rex from an external midi footboard, when I send the CC to “switch to next part” and “switch to previous part” the part does change, however the display does not. For example, if I switch from part 1 to part 2, the midi events change but the display keeps showing “Part 1” even though what is actually playing is “Part 2”. Can you verify if this is a bug or something on my end? Thanks I’m really enjoying the Rex, its perfect for my needs! hello, does the track can record polyphonic ? I mean record chords, or is it monotimbral only ? Each track will record all events received on the associated channel except for SysExes, just like your software sequencer running on a computer. thanks this is looking really neat ! Hello, I just finished my midrex and have a user question. I use a novation remote 25 keyboard to control synths (notes and cc) and it’s templates are allowing me to switch between one synth receiving on midi channel 1 and another one on channel 2. I intent to use the midirex as a live looping device and while recording it seems that I have to choose a unique channel to talk to the midirex (“midi rx channel”) and let the midirex do the playback to channel 1 or channel 2 according to the setting of the track i’m recording in. 1) I understood that i could set “Tracks channels” to “–” to have a kind of channel learn : for exemple having my template playing on Channel 2 and the midirex playing back the loop to that same channel. Currently with “MIDI RX channel” set to 1 and “Tracks channel” to “–” it’s not working, the midirex does not playback the loop, as if i did not entered any notes. Changing “MIDI RX channel” to 2 is working. 2) I also figured that it’s possible to change the root note during the gap while the midirex does the loop : it’s a nice trick to use with an arpeggiated synth as it changes the note of the arpeggio, it also transposes the notes of the loop. But this can be a problem as it also can happen when not wanted (in this case it’s not the “MIDI RX channel” that dictates witch channel enters notes). Also all of this seems erratic : to play-back the loop with the original root note i need to randomly press all notes on the keyboard, sometimes pressing to many keys stops playback. I hope my message is clear enough. Oups, with link : http://ph.neutre.free.fr/Manual midirex.pdf ! Is it possible to record midi on a empty track and that the lenght is fixed when I hit stop? Or do I have to setup the length before? Recording on an empty track with its length defined when you stop recording is the default operation mode. You can also specify length in advance so the recording will stop when track end is reached. In addition, you can change track length after recording is finished (this is not changing recorded notes in the track, so you can shorten the track to play less notes, then increase length to play all recorded notes). Awesome, thank you for your answer ! 1) Internal and external clock. I have set the clock to internal and it records fine, but when I set it to external (using a Behringer BCR200 with Zaquencer software as the master) the Midirex doesn’t record anything. ANy ideas why this might be? 2) I use a sustain pedal for the recordings, but when it is playing back the sustain is not recorded, and the sustain pedal will affect the playback as well as anything I play live. Is there a way to have the sustain recorded and played back, and for the sustain to not affect the recorded notes? 1) Sounds like a bug to me, however it’s not clear if BCR2000/Zaquencer is involved. Could you please try to reproduce the issue using some other clock source? 2) I’ll try to repro…. It´s important form me ´cause I am basically a piano player. I could not repro, external mode recording works fine with all MIDI sources I tries. Could it be cables or the Z sequencer? Hi, I had MIDIrex running perfectly, plugged in and out with other midi instruments : keyboard and sampler. When I copied a track to another song, while it was playing in the background, it create a midi larsen, my synth was squaking and glitching, glitch at the midirex screen too, I had to restart and now midi rex lights on but with a blank screen ! what should I do . It’s the first time I was playing with the midirex and more than 1 MIDI instruments plugged in … nightmare ! Look like you’ll have to reset the device because its memory is corrupted. Power up your MidiREX while holding down SW1, SW3 and SEL to reset it. thanks for your quick answer ! thanks so much ! Now it works … but I’ve lost all my tracks. After device initialization all the tracks are lost. You cannot restored then unless you previously backed them up to a computer using sysex. I have some problems with my actual sequencer working in loop mode. The first beat notes are played back like it where cutoff. It happens when I recorded it just behind the first beat. For example in a 4 bars loop, if I record a note on time 4:4:478 (assuming a hole bar is 4×480) and pretending to play the note on 0:0:000 with a lenght of 0:1:000, what I obtein after the sequencer quantize the note is a 0:0:002 length note in 0:0:000 position. Obviously I am not gonna hit the 0:0:000 position ever, and I can´t always force to play after the fist beat, so it quantize backwards with the hole length. ¿Do the midirex record in the same way? I mean is he going to catch the hole message/lenght of a midi note that is near/just behind to the one beat or is he going to cut the length by playing it back because that sound is OFF the loop. Hope u have understand me. I think i do. however, it’s hard to reproduce. Do you think it would be possible to record the actual notes you are playing into a software sequencer and play them back into MidiREX to make sure we’re talking about the same thing? I quantize the loop to a quaver…for example. 1. To play it a few steps forward of the one beat. For example a note of aproximatly one quater note about 127 steps length on 1:012 step/ position. In this case the in the playback NO PROBLEMS occurs, ´cause the sequencer position it to 1:000 step with the hole length recorded 127 steps….PERFECT. 2. To play it a few steps behind of the one beat. Same note of 127 steps length on 2:467 step/position. What MOXF sequencer does is to consider all sound that is OFF the loop as something to cut. So ….when it plays back the position of the note is correct quantize to 1:000 step BUT IT HAS ONLY 479-467=12 steps length. Hope you can reproduce it now….seems very easy just hitting a note behind the one for a long time and wait to see how it reprduce it. I think YAMAHA hasn´t do the things right….the midi message of that note should be complete played back with only changing the position following the quantize parameter set. Istead…they cut the note for beeing OFF THE LOOP. Thankyou so much for your time…. 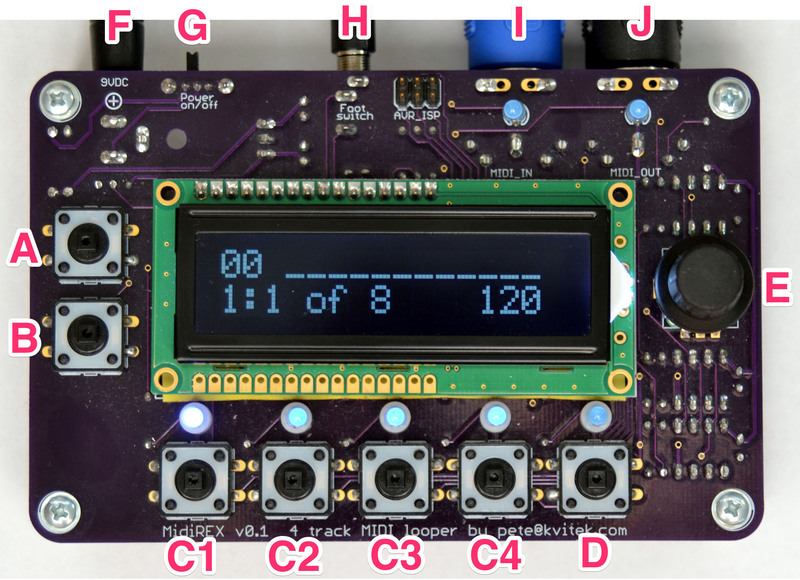 Is it possible to program the MIDIREX so, that each track has its own MIDI RX input channel? I use it for live performances and want to use it as a recorder for MIDI CC data. I have 4 different synthesizers and each sends data on its own channel into the MIDIREX. The data of all channels are passed through the MIDIREX to the MIDI output and sent back to the corresponding synthesizer. that’s good. So every time I want to record CC data (a movement of a cutoff knob), I would need to set the MIDI RX channel to the channel of the synthesizer I want to play, and also make sure that the correct track is selected, that all the data comes back to the right synthesizer. (also for pre-listening) I can play all the Synths with 1 keyboard, but only Notes…The MIDI Controllers i can only move with the user interface of the specific synthesizer which sends and receives data with a specific channel / CC. a function that allows you to select a separate input channel for each track in the MIDI RX window. = by selecting a track, the MIDI RX input channel changes to the same channel that is selected as the output for that specific track. This creates 4 separate data cycles between MIDIREX and 4 hardware devices. Each track is connected to a specific synthesizer. the selected synthesizer will be recorded on his specific track. and no Data is sent to the wrong Synth. Is that possible with the existing source code oder firmware update? MidiREX can only record into one track at a time, so the only feasible option is to add a way to have recording MIDI Channel to follow the currently selected track MIDI channel., which, i believe, is your option #2. ALL — track records on all channels (OMNI mode). Andi — I have a preliminary version of the new MidiREX firmware that allows recording on track channels. Please contact me using email on the ordering page if you’d like to try it. Hello Peter, I’m interested into this version too. thank you very very much !!!!!. Yes! That should work. That’s exactly what I was looking for. I will send you an email and test the program. I’ll post again here if I tested the MIDIREX on my next concert. 1- Is it possible to programme 3X4 sequence, to product 24 steps sequence ? 2- are midi channels (out) per track differents per parts ? I mean part 1 track 1 on channel 4 to volca keys and on part 2 track 1 on channel 5 to volca FM. Then, you can use different synth depending the part. 3- Is it possible to have 2 controleur to the impur ? A keybord and a sequencer like korg SQ1? If possible , Which gear can be used to plug the two controleur? 1) MidiREX is not a step sequencer, so does not record patterns, instead it records streams of notes and controller events, just like Cubase or Ableton. 2) Each track may have a different MIDI channel. Tracks may have different channels settings in different parts. Part contains a full configuration of the sequencer. 3) Any MIDI merger will work for merging input streams. 1- does it mean I can record from my DAW a synth sequence with 24 notes during a 1 bar and half on the daw, and on the second track a 1bar drums ? The 2 tracks will loop at its own end ? The drum track will not wait the end of the synth track to loop ? Yes, this is exactly how it works: the shorter track will loop back earlier than the longer track. Nice, it works like a polyrythmic sequencer. 1. When recording the first track (number 1, 2, 3, 4 – not important) everything is fine. But when I record the next track or just play, without recording, and the midirex is running, some notes disappear (they are not played or recorded). 2. If the last recorded note was not released on the keyboard until the end of the track, it will continue to play indefinitely until it is pressed again and released. Could it be hardware problems? Where should I look for an error? That sounds strange. It certainly not how MidiREX normally works. Did you program fuses correctly? Did you use correct components around the MIDI interface?